Your trees are a beautiful part of your landscape and property, and the last thing you want to do is neglect them. While it may seem like trees pretty much survive and thrive on their own, the truth is that they need care now and then just like the other plants on your property if you expect them to thrive. The last thing you want is to have trees that are badly overgrown so that their health is threatened. That is why getting the right care for your trees is so important. 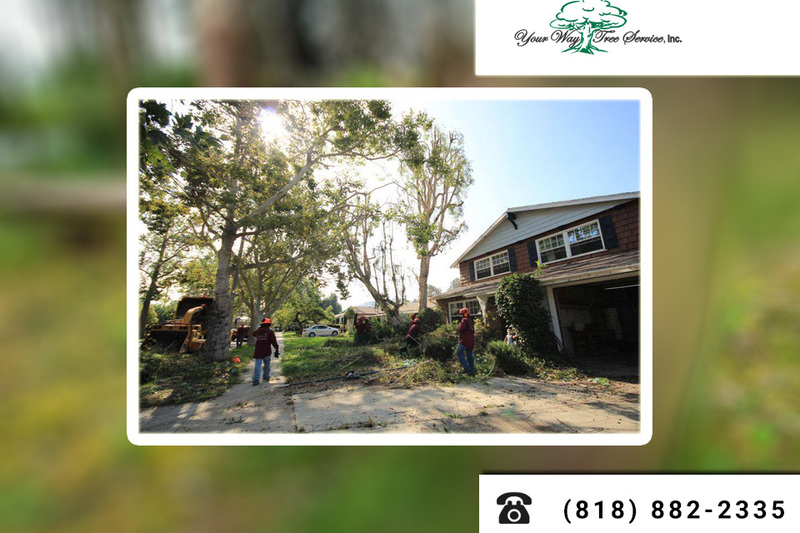 You want to avoid damage occurring to your trees and your property, making it important that you use professional tree trimming in Woodland Hills. If your trees are allowed to continue to grow without any care on your part, at some point the trees may become too large, get entangled with one another, or suffer health problems. Trees that have limbs that become too large may not have the ability to safely support the limbs, leaving them prone to breaking and affecting the overall health of the tree. Proper trimming can help to keep the limbs in the best condition possible, making successful regrowth happen so the tree can live on without difficulties. Getting professional tree trimming in Woodland Hills from a service such as ours at Your Way Tree Service, Inc. can help you to avoid potential damage to your home as well. Large limbs and overgrown trees can easily pose a threat to your home. You may find that one heavy wind or severe storm is all it takes to bring the large limb that hovers over your roof precariously crashing down, putting your family and home at risk. We can come in and trim trees so that they do not threaten your home, your vehicles, or your power lines. If you think your trees need trimming to keep them safe and healthy, call us at Your Way Tree Service, Inc. so we can provide the professional tree trimming in Woodland Hills, you require. You can phone our office at 818-882-2335 to schedule an appointment with us, and we can come out and evaluate your trees for you. With the help of our expert trimming skills, the trees on your property can continue to live safely and give you beauty and enjoyment.